The Eton NSP500B Soulra XL Sound System for iPod and iPhone is a sturdy and innovative stereo speakers boombox that offers the ultimate in portability. 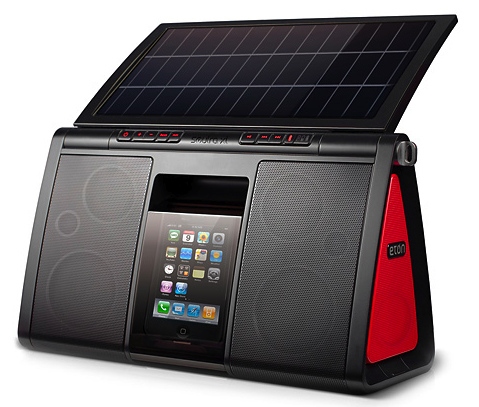 You can use it to play or recharge your iPod or iPhone and, because of its large built in solar panel, you can be off the grid forever. The unit comes with an AC adapter so at home you can plug the system into an ordinary wall socket and recharge its lithium battery in a few hours. It also ships with a gel-padded shoulder strap and is quite comfortable to carry around. If you’re at the beach or hanging out at a pool or campground, just set the unit in the sun, lift its solar panel, and you’ll typically get enough juice to keep the music going for around five hours. The length of time may vary depending on where you live and the intensity of the sun. In the Pacific Northwest it might take a little longer to recharge. But I live in Tucson and the sun here is so intense that a columnist once remarked that in the summer months people have to move their sundials into the shade to keep them from running fast. You get the picture. The first thing you notice when you lift the Soulra XL out of the box is that it is not flimsy. The unit measures 15.1 x 5.2 x 8.1 inches and weighs 7 pounds but it’s compact and has an industrial feel. The receptacle for the iPod is located behind a tinted plastic door that swivels forward and closes securely to keep dust and water off your player. When you press the power button on the top panel a series of red lights and icons indicates the source of energy you’re using and the condition of the battery. The left side of the panel has a power button and volume controls plus a button for bass boost. There is no control for the treble, but if that’s an issue the user can make adjustments with the equalizer settings on the iPod itself. The buttons along the top right side of the panel mimic the navigational controls on the iPod (forward, back, pause). The XL is an upgrade to the first solar iPod player that Eton, which specializes in environmentally friendly products, brought to market last year (see our MyMac review here). The new unit is heavier and has a larger (72 square inch) enhanced monocrystal solar panel and a rechargeable lithium ion battery pack. The larger panel means five hours to reach a full charge rather than the eight required for last year’s model. The XL also comes with a remote control and a recessed storage space for it concealed under the solar panel. There were some mild complaints about the sound quality of the earlier Soulra. I can’t compare the two because I never heard the first one. I did compare the XL to the sound from my Bose SoundDock which is more compact than the Soulra but not nearly as portable. Not surprisingly, the Bose, which sells for about $200 more than the Soulra, had a much more refined sound and greater depth throughout the audio spectrum. I also compared the Soulra sound to the high end Canton speakers in my living room, an unfair comparison because the boombox was never intended as a competitor to that kind of equipment. Good to keep that in mind when you check out the Soulra XL. The key, then, is to be realistic. The Soulra XL is a durable, innovative player/charger that provides portability and independence and a green alternative to power consumption. While there is hardly anything disappointing about this product, its average speakers and the absence of an earphone jack, earn it a MyMac Review Rating of 8 out of 10. Also, many people have found it beneficial to look at J&R speakers to find products similar to this one. If you are outside with the solar panel open, you actually get a trickle charge that will play the unit for 8+ hours. The five hour playback time is if you have a full charge and play it indoors, or a full charge and have the panel closed outdoors. The Soulra also comes with an excellent remote control which I hadn’t used before writing my review. I’m convinced the world is divided into people who like remotes and those who just like to punch buttons and fiddle with the controls on the unit. I was of the latter school and I now confess to Wrong Thinking. Recently I started using the Soulra’s remote and ws amazed at how different it is. The whole unit is encased in a rubberized material that makes it comfortable to hold. It’s a slender device and in its buttons mimic all the controls on the unit itself. Not only can you control your iPod’s play list and the volume, you can also adjust the bass. And when you’re done using your remote you can store it nicely under the Soulra’s solar panel.There’s a nice recessed compartment where it can rest unobtrusively while you travel. The more I’ve used the Soulra, the more impressed I’ve been with the quality of its sound and its wonderful portability (right down to its luxurious shoulder strap).